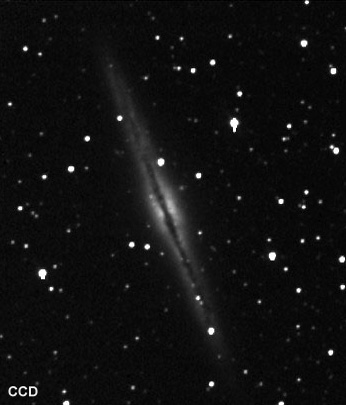 Images are taken with the same instrument - 8" f/6 Newtonian. The film is a HTP 2415 developed in MWP-2. Date: 24 October 1993. Exposure time: 38 minutes. Developing time at 20 deg. Celsius: 9 minutes. The CCD frame is a 3 x 4 minutes exposure with the Cookbook Camera - 378 x 242 mode and with LDC on.